Marine social-ecological conditions in the Arctic are rapidly changing. With many transboundary issues, such as shifting ranges of fisheries, biodiversity loss, sea ice retreat, economic development and pollution, greater pan-Arctic assessment and co-management are necessary. 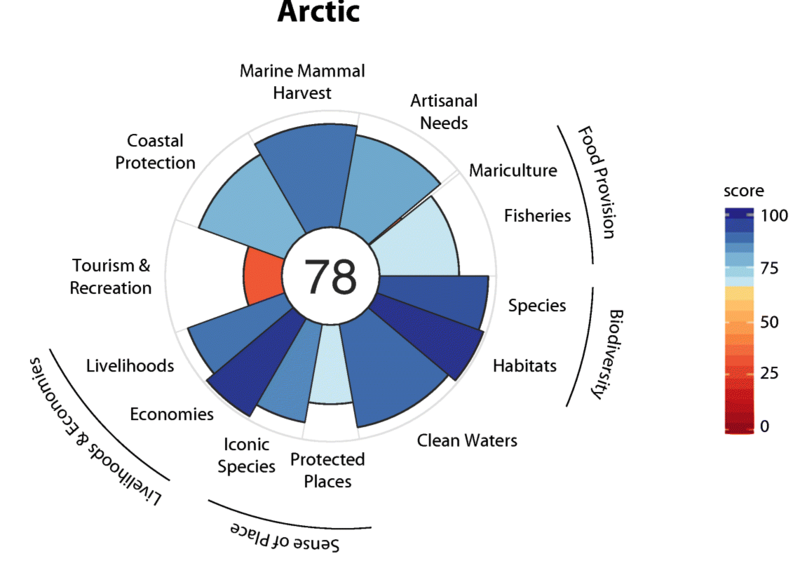 We adapted the Ocean Health Index (OHI) to compile pan-Arctic data and evaluate ocean health for nine regions above the Arctic Circle to assess the extent to which pan-Arctic assessment is possible and identify broad social-ecological trends. While the quality and availability of data varied, we assessed and scored nine OHI goals, including the pressures and resilience measures acting upon them. Our results show the Arctic is sustainably delivering a range of benefits to people, but with room for improvement in all goals, particularly tourism, fisheries, and protected places. Successful management of biological resources and short-term positive impacts on biodiversity in response to climate change underlie these high goal scores. The OHI assesses the past and near-term future but does not account for medium- and long-term future risks associated with climate change, highlighting the need for ongoing monitoring, dynamic management, and strong action to mitigate its anticipated effects. A general increase in and standardisation of monitoring is urgently needed in the Arctic. Unified assessments, such as this one, can support national comparisons, data quality assessments, and discussions on the targeting of limited monitoring capabilities at the most pressing and urgent transboundary management challenges, which is a priority for achieving successful Arctic stewardship.